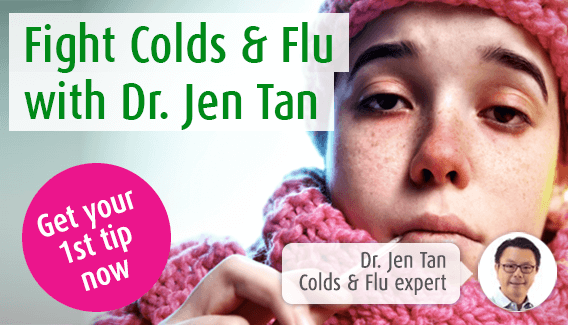 Find out if all those well-known cold remedies are fact or fiction. We all know how it feels to have a cold – the coughing gets tiring, the sore throat is uncomfortable and the sniffing is just a nuisance. All these symptoms together can leave us feeling run down and desperate for an effective solution. Scanning the shelves and online forums can lead us to a whole plethora of information regarding how to deal with a cold but, with all this instruction at our fingertips, it can be a challenge to work out the truths from fiction. That’s why we’ve made a list of the facts and myths surrounding cold treatments. By knowing the myths you’ll be able to skip them out and treat your cold in the most effective way possible! What happens when you catch a cold? There are many obvious ways of catching a cold – on the bus you inadvertently sit in front a poorly, sneezing child for example, or you open an office door where the handle is less than clean. The germs are easily transferable and so you too soon find yourself moping around the house, sniffing and sneezing in every direction. What actually happens to your body when you catch a cold though? Well, the immune system is the body’s way of defending itself against viruses and bacteria, which are also known as pathogens. If a pathogen gets past the body’s defences and manages to infect tissue cells, the immune system tries to destroy them which can cause symptoms of a cold including a raised temperature, a sore throat and a runny nose. I suspect that when you begin to experience these symptoms, you look around for things to make you feel better. Fortunately, there are a number of remedies and cold-busting suggestions available to us, through a wide range of sources. However, today’s blog lays out the myths and the truths surrounding cold treatments to prevent you from wasting your time on the ones that won’t work! This is a definite myth and, in fact, your GP won’t even prescribe antibiotics if it’s a cold you are suffering from. That’s because this medicine will not make you recover faster nor will it relive the symptoms of a cold. Antibiotics are only useful in fighting bacterial infections and colds caused by viruses. Instead of making the trip to your doctors, you could try an effective herbal remedy for cold symptoms such as our Sinuforce Nasal Spray. This nasal spray contains menthol, peppermint oil and eucalyptus oil to clear and soothe a blocked nose and ease breathing. Unfortunately this one isn’t true so you can put down that hot chocolate and turn to something healthier instead! Sugar actually works against the immune when it is busy trying to fend off your cold. Sugar also competes with vitamin C which, as you will see later in the blog, is really helpful if you have a cold. So, even if you don’t feel like eating much, it’s important to be cautious about what you do consume when you’ve got a cold. This would be a great, simple remedy if it was true but unfortunately milk will not cure your cold. When you have a cold your body produces excess mucus which is already quite unpleasant. However, milk can actually make this symptom worse as it makes mucus thicker. Water or a warm herbal tea such as Jan de Vries Dutch Herbal Tea would be a great alternative to hot milk. This will help to calm a sore throat and provides a bit of comfort when you’re not feeling well. Some might consider this an ‘old wives tale’ but, in regards to a cold, it does have some truth to it. We are definitely not saying you should starve yourself if you have a fever because, whether you feel like eating or not, the body needs food and water to keep going. However, there is some accuracy to the phrase ‘feed a cold’, because our body needs energy and nutrients in the form of food to recover. There are a variety of internet articles and scientific studies that both agree and contest with this saying, but we don’t need to delve into the depths of the issue. Basically, diet plays a big part in fighting infections and increasing the strength of the immune system so it’s unsurprising that the term ‘feed a cold’ has become a well-known one. Whether we’re healthy or poorly, we must make sure our body maintains a balanced intake of nutrients to aid the immune system in its defence against illness. For adults, this suggestion will help deal with the symptoms of a cold including a sore throat. The warm water soothes the throat whilst the salt acts against mucus to relieve the discomfort that this problem brings. Just make sure you spit it out afterwards! This is a slightly more unusual declaration regarding colds and is not one that can be so easily defined as myth or fact because there’s not a lot of research on the matter. Nevertheless, I’ve put ‘yogurt helps you beat a cold’ under facts because of what we know about yogurt. Yogurt is a nutritious food that also contains probiotics which are known to help boost the immune system. However, even if yogurt doesn’t make a significant difference to your cold, it’s still a good choice at this time. The smooth consistency of a yogurt for example, makes it an ideal for someone with a sore throat. You’ve probably been told to eat oranges or drink orange juice when suffering from a cold at least once in your life. Well, the person looking after you was right! Oranges contain vitamin C which is vital for maintaining the immune system and so this point, that oranges can help tackle a cold, is another fact. Oranges also contain lots of antioxidants and nutrients which will help to fight off colds if you come down with one. Yes it does! A product such as Echinaforce, which is made from fresh Echinacea, helps to strengthen the immune system and fight against cold and flu symptoms. Also, the great thing about Echinaforce is that it comes in various forms. The Echinaforce Hot Drink for example, helps to relieve the symptoms of a cold or flu, such as headaches and aching limbs, whilst the warm liquid soothes the throat. Did your granny make you drink warm diluting juice as a child to help fend off nasty colds? Well, she had good reason to! Warm drinks are soothing and comforting so will help relieve symptoms of a cold such as a sore throat and coughing. Plus, lots of coughing, sniffing and sneezing can mean that your body is losing more fluid than would normally be the case. Therefore, if you’re ill it’s important to keep your body hydrated and warm drinks can help with this. Have a look at our blog ‘the best drinks to cure your cold’ for more suggestions on what to drink when you’re poorly. We’ve all heard and relied on this cold remedy, but does it actually work? Well, mixing lemon and honey together with warm water once again creates a comforting drink that will help to soothe your throat and ease coughing. So, yes, it does work! Honey is also antibacterial and antiviral whilst the lemon can be good for clearing a blocked nose. With all these cold-helping qualities, no wonder we’ve all heard of it and rely on it too! This statement is true as studies have shown that zinc can reduce the length of a cold.1 You can obtain more zinc through supplements but also through your diet. Things like cashew nuts, eggs and pumpkins seeds all contain zinc and make easy snacks when you’re not feeling well. When you’re ill, it’s more important than ever that the things going into your body are good for you. Aim for a variety of fruit and vegetables to get as many vitamins, minerals and nutrients into your body as possible to help boost your immune system and fend off a cold.